This summer, I’ve been traveling, touring international conferences which I attended personally or was engaged with in some other way. The conferences were on the topics I work with: collaborative online communities (Wikimania, taking place in July in Washington and Wikisym in August in Vienna), digital politics (Personal Democracy Forum in June in NYC and Internet, Politics, Policy in September at Oxford), and commons (Knowledge Conference Commons of the International Association for the study of the Commons in Belgium in September), among other events. Those are diverse conferences – some more academic and others more action-oriented – and they have different thematic and disciplinary focus. However, they are all in the field of Internet/technology and society. However, even if to a certain degree they all build upon an interconnected community of those interested in technological and societal issues, I am amazed how diverse they are in terms of gender inclusion. In other words, in terms of gender, some conferences are able to engage a diverse set of speakers and participants, in which women are also present, while others largely include almost only men in their programs. To give you an example, the organizers of Wikisym were almost all men: 89% of the Symposium Committee, 78% of the Program Committee, and 80% of the program of speakers were men (according to the data provided on the program web page). 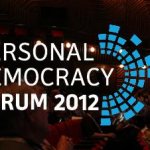 In contrast, in the Personal Democracy Forum, the gender ratio of speakers was more balanced and inclusive, with 60% men and 40% women speaking (according to the program). Traditionally, technological sectors (even if this is not true of all of them) were and still are majoritarily populated by males. In this regard, conferences in those sectors might be expected to reproduce this ratio, which might explain in part this strong male predominance at conferences. However, it seems to me that in some cases, some of these conferences not only reproduce the gender imbalance of the sectors they appeal to, but actually reinforce them by presenting programs with even worse percentages than those regular in these sectors. Importantly, this is not a disconnected situation. Conferences also build these sectors; the conferences also shape the gender ratios of their sector and could therefore help to improve the balance there. The gender(gap) could change, but it will not change alone, without actions for change. In a “just do it” spirit, and in order to go more in-depth into the question of gender inclusion at Internet and society conferences, I decided to inaugurate a “pro-bono” research series called “What is the gender(gap) of….?”. It consists of a plan for doing a statistical analysis of gender inclusion at the conferences I attend. It will provide an empirically-based indicator of gender inclusion at each conference that may help to provide a more grounded comparison between each conference. I hope that “What is the gender(gap) of…. ?” will contribute to increasing gender consciousness, provide a more grounded picture of the question, and contribute to systematizing “best practices” in order to reduce the gender gap at Internet and technology-related conferences. The research methodology itself is very simple. It is based on counting the male and female participants in every area of engaging with a conference. However, it is important to acknowledge that gender equality is more complex than gender balance (that is, the equal presence of males and females). In this study, I adopt gender balance as an indicator of gender equality, on the assumption that better gender balance might contribute to improve gender equality, even if it is not by any means a perfect indicator. It should also be acknowledged that gender is a complex construction that goes beyond the categories of female and male, such as with hermaphrodites. However, for the purposes of this study, I restricted the categorization of gender to female and male for the sake of methodological simplification. I classified people according to their names and/or appearance in pictures provided on the conference website. I considered people in as many contributory roles as I had data for: that is, I considered not only speakers and key speakers, but also organizers and attendees or testimonies. What is the gender(gap) of …. OKFest? The “What is the gender(gap) of …. ?” research series is inaugurated today with the case of the Open Knowledge Festival taking place in Helsinki on 17-22 September 2012. To me, the is no doubt that this is THE conference of the year for building a free and open knowledge movement world-wide. 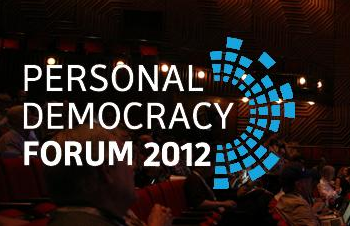 (See online schedule for live streaming: http://okfestival.org/onlineschedule/#tue.) I am part of the conference’s Advocacy Board, am part of the organizers of the stream, and have been accepted as speaker in one of the streams. According to the analysis, overall Okfest is 73.16% male and 26,83% female. The conference role in which women are most present is as guest program organizers, at 41% women (but not core organizers, where the women drop to 20%), which is more than as speakers (27,5%) or featured speakers (19%). (Visualization thanks to Michael Bauer @mihi_tr)The conference is organized in 13 thematic themes linked to open knowledge. In terms of women engagement by scheme topics, “Gender and Diversity in Openness” (75% women) is the only topic stream in which women speakers are predominant, followed (at some distance) by the topic of “Open Cultural Heritage” (42,85%), “Open Development” (38,88%), “Data Journalism & Data Visualization” (38,09%), and “Transparency & Accountability” (32,96%). The topic streams “Open Research & Education” (24,24%), “Business and Open Data” (24%), “Open Geodata” (22,22%), “Open Democracy & Citizen Movements” (21%), “Open Knowledge & Sustainability” (19,35%), “Open Cities, Open Design, Hardware, Manufactures & Making” (17,24%) have fewer than 25% women, while the female presence in “Open Source Software” stands at the lowest performance with9%. Additionally, 28,5% of testimonies on the website are from women. This data seems to suggest that including an activity that directly refers to gender in the program might be a way to improve women’s involvement in conferences. Observing the relationship between guest program organization and the number of speakers per stream seems to suggest that (in some cases) involving more women in organizational tasks tend to have a higher presence of more women in the program of speakers. However, the data does not provide strong statistically significant support for this. And gender(gap) and … you? 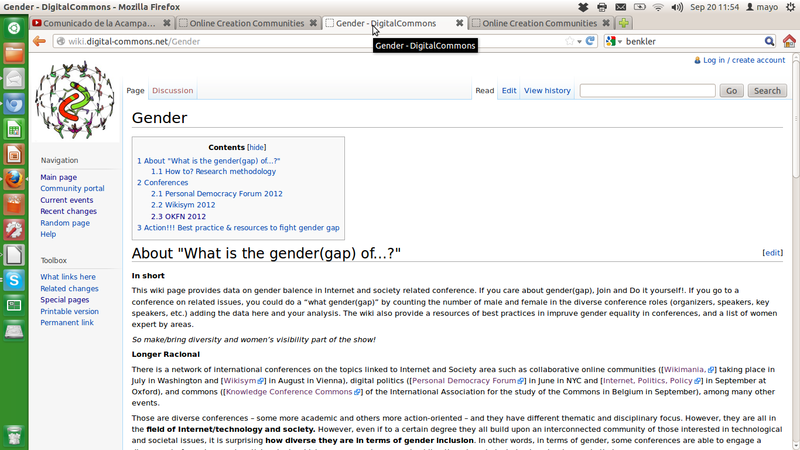 “What is the gender(gap) of…?” has a wiki spirit and format. 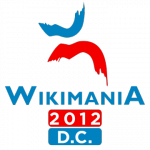 This wiki page provides the presentation and data for each conference analysis. If you care about gender(gap), “Do it yourself, too”!. If you go to a conference on related issues, you could do a “what gender(gap)” and link a wiki page with the data on your case and your analysis. The wiki also provide a resources of best practices and a list of women expert by areas. So make/bring women’s visibility part of the show! 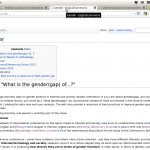 Wiki: What is the gender(gap) of…? Dear Mayo, I had the pleasure to be at a couple days of OKfest (and am in that category of white male, albeit not necessarily techie) and was at most of the gender inclusion discussion where the ‘numbers’ on the event were released. I was a bit surprised by the numbers as I had expected these to be much higher for women, given the presumably ‘inclusionary sensitive’ context of open knowledge where there are many projects and initiatives which stress gender equality and participation. One point I found missing from the data (as far as I could tell) was the gender ratio of institutional or organisational representatives/directors at the festival, where I had the impression that of this group a significantly high percentage were women. So, this is a particularly qualitative … and not scientific impression where it seemed to me that a relatively high number of key players, game changers, and influencers were women – beyond the simple overall stat of 73 / 27. You might find a paper I published last year of interest – http://bit.ly/womenpub. It’s a study of women’s publications in academic computer science, and covers womens’ participation in about 50 years of CS conferences. I think you might find it interesting. Stephen thank you very much for your comment. I do not have data to corroborate your observation, however, it is interesting and we can see if we could collect these type of data in future occasions. I added your comment to the wiki, so we can have it present, I hope it is ok (http://wiki.digital-commons.net/Gender/okfest#Comments_and_evaluations_of_the_data). Jofish thank you very much for your comment, too. I read the paper and it is very good contribution to the field. I am glad you did this fabulous work!!! The tool you developed Genderyzer. It is a tool for determining the gender mix of a list of names. You provide a list of names & it tells you the % of women & men. I am sure I am going to use it frequently in further counting on gender in conferences. I’m not comfortable with gender being defined as only “male” or “female”. It is a spectrum and there are many people who do not identify themselves as belonging in either one of these pigeon-holes. I was at OKFest and the thing that struck me was the lack of racial diversity.